Home is where my craft room is ...: 4 down ... 46 to go!!! I used Christmas Frames from the Cutting Cafe, a Papermania Christmas Tree embossing folder (free with magazine) and Coordinations Whitewash card. After sanding the card, I highlighted it with brilliance ink pads (Rocket Red Gold and Pearlescent Olive), coloured organza ribbon to match and added Stickles to the tree. I'm off to make some crackle backgrounds for my next project now ... I'll share it later. 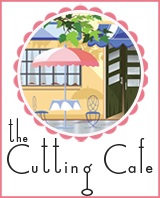 Louise, these are wonderful cards... so well designed.... and I love that you are using Cutting Cafe in the design. Thanks for your visit to my blog.